Throughout theatrical history, almost every element in stage production has been recycled. Indeed any regular theatergoer is familiar with the experience of a performance that conjures the ghosts of previous productions. The Haunted Stage explores this theatrical deja vu , and examines how it stimulates the spectator's memory. 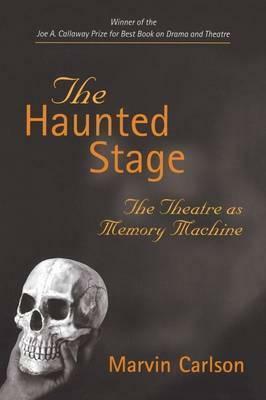 Relating the dynamics of reception to the interaction between theater and memory, The Haunted Stage uncovers the ways in which the memory of the spectator informs the process of theatrical reception. Marvin Carlson is Sidney E. Cohn Distinguished Professor of Theatre and Comparative Literature at the City University of New York. "This clearly written book takes us on a scholarly and personal journey, linking Carlson's expertise in ancient and early modern theatre history to his enthusiastic theatre-going in the United States and abroad over the past thirty years. . . . This rapid movement across time enables a valuable subtheme--the tendency of the romantic and realist theatres not to contradict one another, as is usually taught, but to echo each other's individualist temper in favoring 'exact and specific settings, unique to each situation and free of the memories of the theatrical tradition'. Equally exciting are Carlson's discussions of the recycling of proverbs, folktales, and fabliaux of opera plots; and of concepts in the postmodern stagings of Daniel Mesguich, Tadeusz Kantor, and others." -- (04/02/2003) "Carlson's insistence that ghosting is a practical technique, one continually and consciously exploited by theatre artists through the ages, complements the more abstract theories of theatrical repetition circulating in contemporary performance studies. Written in accessible, jargon-free prose, The Haunted Stage will be equally useful to performance theorists, students of world performance traditions, and theorists of social memory and its relation to material culture. The book's historical and geographical scope renders it all the more impressive. From Noh to the Wooster Group, Hamlet to Hamletmachine, commedia to Contact, The Haunted State provides a long overdue ghost tour of theatre's many haunted houses." -- (05/08/2003) "Through theatre we can, Carlson suggests, grasp the 'dynamics of cultural memory itself.' . . . As in his other books, Carson is here almost supernatural in the scope of his reference. His reach extends to every part of European and American theatre history and touches as well on Asia, most confidently on Japan. He is able to orchestrate the din of cross-continental and cross-temporal citation into a sonorous score, like a channel surfer who never misses a wave and always arrives safely on shore." -- (06/01/2003) "An unexpected approach of the performance phenomenon by an irresistible investigator. . . . A point of departure for an enriching promenade." -- (09/01/2004) ." . . an interesting tapestry of theater cultures and history from around the world--Western theater and Noh and Kabuki. This is one of the few works devoted to how memory can be stimulated and used within the context of the theater. Nowhere else is the concept of audience reception and memory so readily discussed. Valuable not only for theater students and practitioners, this volume has practical application for psychologists and sociologists as well." -- (08/07/2002) "The theater ghost--whether it takes the form of the celebrity-possessed dramatic character (as in Kelsey Grammer's Macbeth), or the character-possessed celebrity (as in Rip Van Winkle's Joseph Jefferson), or the fixed locality of the Noh stage or the periodically returning scene in Tate Wilkinson's memoir--is an uncanny manifestation of the theatre's role as the caretaker of cultural memory. This is a wonderful book that will make a superb addition to scholarship in the field of theatre and performance."